The UK ally put to death three people found guilty of a deadly bomb attack, but activists say the charges were politically motivated. Bahrain couldn't be more different to the UK right now. Tear gas has been fired at several dozen people protesting the execution by Saudi Arabia of prominent cleric Nimr al-Nimr. Demonstrators carrying pictures of the cleric clashed with security forces in the village of Abu-Saiba, west of the capital Manama. Two on-duty policemen were killed and a three were badly hurt in a terrorist bomb attack in Bahrain, the country's Interior Ministry has said. Five other officers suffered minor injuries in the bombing, which happened in the mainly Shi'ite village of Sitra, south capital city Manama. The UK is set to send more warships to Bahrain's Mina Salman Port as it establishes a new £15 billion military base in the Gulf state. The son of the King of Bahrain could be arrested if he steps foot on British soil after the High Court ruled he was no longer immune from prosecution because of his royal status - if new evidence emerges. Prince Nasser bin Hamad al-Khalifa is said to have been directly involved in the torture of three prisoners during a pro-democracy uprising in February 2011. One prisoner, known only as FF who has been granted asylum in the UK, claims he was badly beaten - but not by Prince Nasser - and given a prison sentence after taking part in protests in the Gulf state, which have since left dozens dead. FF now plans to provide the Metropolitan Police Service with evidence of the Prince's alleged actions. However, the Bahrani government said the claims were unfounded and politically motivated. In a statement, it added: "The situation has not, and will not, change as there is no evidence for the allegations." Prince Nasser is a regular visitor to England and has met the royal family. A decision by the Director of Public Prosecutions that the son of Bahrain's king is immune from prosecution for alleged torture has been quashed in the High Court. 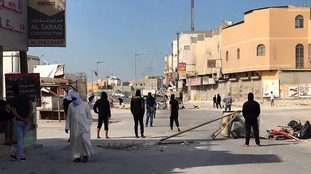 A small explosion was heard in the centre of the Bahraini capital Manama on Sunday, three witnesses said, though the cause was not immediately clear. Police blocked off the road where the incident took place near a government security building in the Adliya district, and a security source at the scene said a car had been damaged by fire. The source did not elaborate and there were no reports of casualties. The incident took place as the small island kingdom hosted a Formula One Grand Prix, staged about 20 miles south of Manama at the Sakhir desert circuit. Small bomb explosions occur sporadically in the US-allied monarchy, which has witnessed low-level political unrest since 2011 when the Shi'ite Muslim-led opposition organised demonstrations demanding democratic reforms in the Sunni-led government. The Duke of York is set to visit he protest-hit country of Bahrain on an official visit. Prince Andrew's trip begins tomorrow and comes after the Government requested he to travelled to the Middle Eastern state. Bahrain's government, dominated by members of its royal family, has been accused by campaigning groups of a string of human rights abuses since 2011. Critics claim little has changed since then and trouble has flared up consistently since those first demonstrations. Red Bull's Sebastian Vettel took his second win in four races this year as he won this year's controversial Formula One Grand Prix in Bahrain. Activists clashed with police and blocked roads into the capital in a bid to disrupt the race. Bahrain's Crown Prince Salman says a reform process is under way, and denies using Formula 1 for political gain.